Times Internet Ltd has unveiled its cricketing portal GoCricket.com. The portal, which is basically a cricket news destination with editorial content and videos, is available on multiple digital platforms. These include the web, WAP, iOS, Android and feature phone low bandwidth internet users. Launched ahead of the Indian Premier League 2014, the portal will enable users to watch IPL matches, and will also feature a video scorecard, with real time video clips integrated into the scorecard. For the live telecast of matches, the company has partnered with Star TV. Along with rich photos and videos, GoCricket will also feature writing from around the world, connecting cricket fans with experts and writers. Apart from guest writers like former Indian cricket team captain Sourav Ganguly, the company has also hired editors and writers like Jamie Alter and G Rajaraman. Users can also sign up for an account to get mobile alerts and track their favourite players and teams. Can it create a niche? Although Times Internet through the group's media vehicles has been involved with providing cricket related content for years this marks a focused property. However, it would come as another player in a market dominated by ESPNcricinfo (formerly cricinfo) and CricBuzz among others. 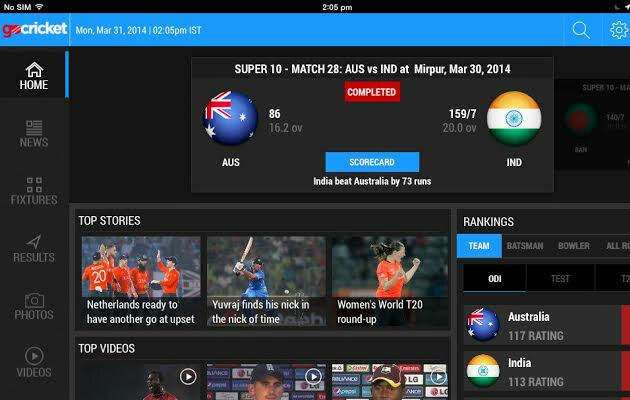 This IPL season, MGuru, an Ahmedabad-based startup has also launched CricLive, an app that gives out real time live score on phones allowing one to stay updated with all the cricket match updates around the world. 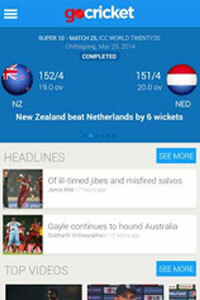 Earlier, Web18-owned CricketNext was integrated into IBNLive.com. GoCricket is very visual and colourful in nature and allows you to read through in Zen mode, which basically seeks to ensure that you don't get lost in the bright colours used in the portal. But we feel that the portal needs a better user interface. GoCricket seems to have wasted a lot of space on scores though it can be given credit for ease of navigation. However it is not as in-depth in terms of content as ESPNcricinfo. There is also a country wise segregation of news on it. One element incorporated in GoCricket is that the users can also sign up for an account to get mobile alerts and track their favourite players and teams. TIL has over the years created multiple internet properties backed by in-house content from the group's media vehicles as also few acquisitions in various niche domains. This shows its intent to catch a chunk of internet audience through specialised properties rather than putting all the eggs in one portal Indiatimes. This also expands the breadth of options it can serve to its digital advertisers.